Adam Thomas, founder of Timberline Smokehouse, is also the owner of Thomas Smoked Meats, based in the same town. Thomas originally offered his jerky in 1998 under the Thomas Smoked Meats brand, which he continues to do today. In 2008, he decided to take his line of beef jerky national, under the Timberline Smokehouse brand. Both brands utilize the same recipe. Thomas gained local fame with his unique line of jerky flavors, notably the "Beer Jerky", which is actually marinated in beer. He also has a jerky marinated in Tequila. I'll be reviewing all those later on. Beef, soy sauce, worcestershire sauce, water, spices, salt, dehydrated garlic, onion powder, sodium nitrite. The first thing I taste from the surface of these pieces is a smoky flavor, followed by a light saltiness. I can also feel a light spicy burn in the back of my mouth. Overall, a light flavor intensity off the surface. 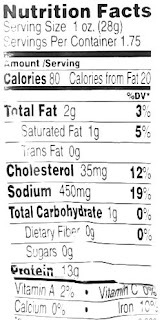 The chewing flavor starts with a light natural meat flavor, and a slight bit more saltiness. There's also a faint bit of flavor coming from the garlic & onion. Identifying the primary flavor component in this is difficult, since nothing seems to stand out as being prominent. But I'd have to give it to the saltiness, at least I think that's what gives this jerky most of its flavor, from the surface and the chewing. I'd consider it at a moderate intensity. Despite the soy sauce and worcestershire sauce listed higher than the other flavorings, I don't really notice them much. They don't seem to have much definition. The natural meat flavors perhaps have the second strongest flavor component, though still a light flavor overall. It's just strong enough to notice against the saltiness. I can identify a light smokiness in that meat flavor. The garlic & onion flavorings seem to provide a little bit of taste interest to this. They're not strong enough to notice individually, but I can identify their influence on the overall flavor. There's also a light black pepper flavor to this also. I can see some pepper corn chunks stuck to the surface. That light spicy burn I mentioned earlier continues as I eat more of this jerky. I can see a few chile pepper seeds on these pieces, and where my teeth chew open a seed, I get a faint taste of chile pepper flavor. I see this jerky as "mild-medium" on my hot scale, but folks with lesser tolerance for heat, could see this a step higher, at "medium". Overall, what you're going to taste in this the most is a saltiness, colored just a bit with some garlic & onion, a bit of spiciness from the chile peppers and black pepper, and then a light natural meat flavor, with a light bit of smokiness. These are slices of whole meat, sliced medium to thick thickness, and in small chunks and strips. This is a semi-moist jerky, with a lot of oil & moisture on the surface. The pieces seem soft and tender. Biting off chunks is mostly easy, though some of the strips are cut with the grain, and can require some gnawing and pulling. For the most part, it's easy to eat. The chewing texture starts out feeling a bit stiff, but still having that soft and tender feel. Just a little bit of sucking and light biting is all that's needed to break it down, and it chews down to a soft mass rather easily. At that point, it has a very steak-like texture, comparable to a steak cooked medium-well. Here and there I can see small bits of fat on these pieces. In the chewing, most pieces seem to contain some unchewable wads of tissue, like some stringy sinews or tendon. As for clean eating, my fingers pick up a lot of oil handling this jerky, requiring finger licking and jeans wiping each time I touch. Timberline Smokehouse sells this Original variety at a price of $9.00 for three 1.75oz packages. If you spend more than $25.00, the shipping is free. I bought $36.00 worth, encompassing several of their varieties. That works out to a price of $1.71 per ounce. 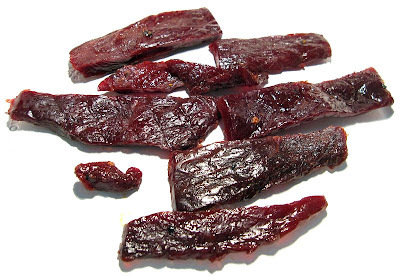 For general jerky snacking purposes, at the $1.71 per ounce price, this jerky seems to provide a good value. I'm getting a good deal of snackability from its good overall flavor, good meat consistency, and good chewing texture. That $1.71 price per ounce is the same as what you'll pay for the mass-market brands at your local grocery store, except you'll get better flavor and texture. 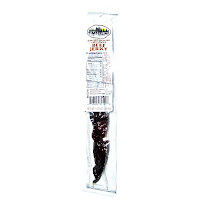 This Original variety from Timberline Smokehouse offers a good deal of snackability through a good overall flavor, a good meat consistency, and a good chewing texture. The flavor is largely marked by a saltiness, with a light smoky natural meat flavor, boosted by light amounts of seasonings, garlic, onion, black pepper, and chile pepper. It's largely easy to eat, being moist, soft and tender, and it has a chewing texture very much like eating a piece of steak, though your fingers will get quite oily handling this stuff. I just kept wanting to find a flavor other than saltiness to define this jerky. 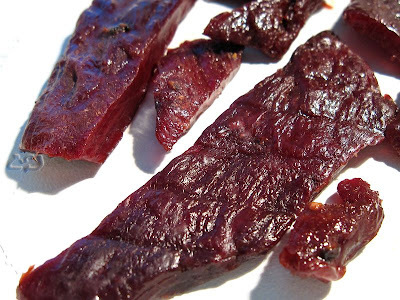 The natural meat flavors are light enough that it doesn't really dominate this jerky. The other flavorings are also quite light. It's like I'm anticipating the star of the show to appear, but never appears. My recommended beer pairing for this would be a red ale.